"It's our Sneinton" is phrase we've heard a lot from our friends and neighbours in the area, a great sign that many people feel a sense of ownership and belonging in the area. But it's often balanced by a view that we're not properly listened to when it comes to tackling local problems and making decisions about what happens next. So "Our Sneinton" is a great name for a new project which aims to inform people in the area about their Community Rights - including the Sneinton Neighbourhood Plan - and support them to get active in the community and have a voice. 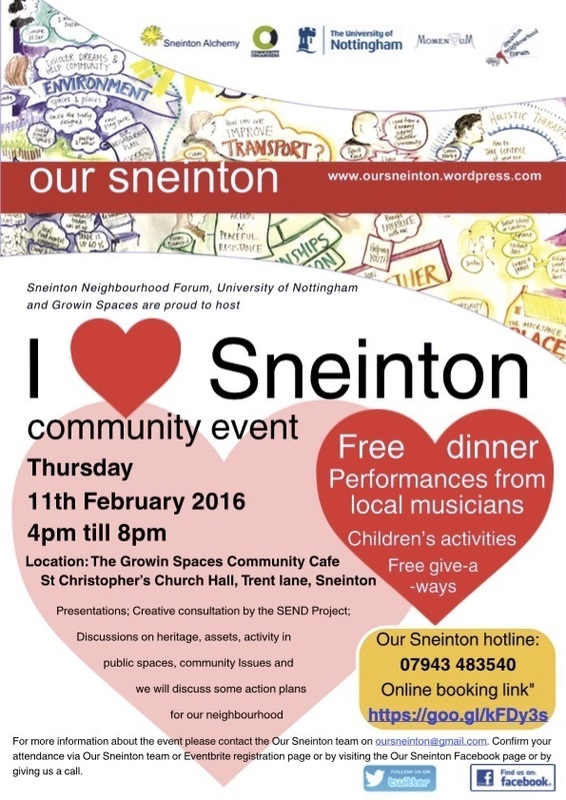 We're excited about an event that Our Sneinton are organising on February 11th 2016: It's called "I LOVE SNEINTON" and it will feature a load of great ways to find out about the progress of the Neighbourhood Plan and to have your own input. The Our Sneinton Team have been hitting the streets with their pop up booth, and out pounding the pavements to bring you their first of 3 newsletters, which you can download and read. It's packed with great background information on Community Rights, Neighbourhood Planning and how you can get involved.